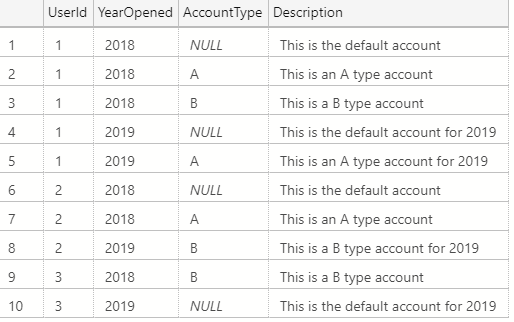 It’s important to be aware of columns that allow NULL values since SQL Server may handle NULLs differently than you might expect. Today I want to look at what things to consider when joining on columns containing NULL values. Since it’s not possible to join on NULL values in SQL Server like you might expect, we need to be creative to achieve the results we want. 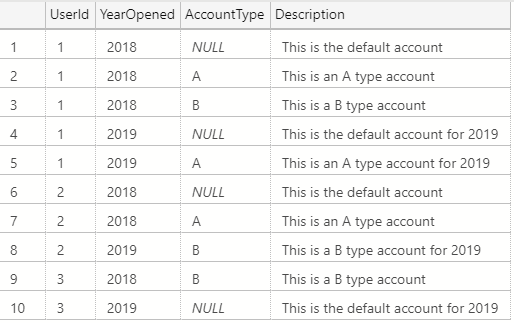 One option is to make our AccountType column NOT NULL and set some other default value. Another option is to create a new column that will act as a surrogate key to join on instead. Both of the above options would fix the problem at the source, but what about if we can only make changes to our queries? In the above example we converted NULLs to the ` character. If we had a valid ` character in our data, we would get logically incorrect joins. Our query can no longer perform index seeks. The first issue isn’t a huge deal if you can guarantee the character you are replacing NULLs with will never appear in the column of data. The second issue is more important since ISNULL prevents your query from being SARGable and will cause poor performance on large tables of data. Those Compute Scalar operators are forcing SQL Server to Scan the indexes and compute a value for every row. If using a function like ISNULL hurts the performance of our queries, what can we do instead? There are no seeks here since I don’t have any additional filters, but the lack of Compute Scalar operators should be enough to prove the point. While there are a few more variations that can achieve the same results using different execution plans (writing a query that joins non-nulls and unioning it with a query that selects only the nulls, using a computed column to convert the NULLs to non-null values, etc…) the key to good performance is to choose a solution that will not force SQL Server to compute values for every single row. This post is the first in a series about physical join operators (be sure to check out part 2 – merge joins, and part 3 – hash match joins). These three little icons may not seem like the most obvious place to begin troubleshooting a slow query, but with larger plans especially I like starting with a quick glance at the join operators because they allow you to infer a lot about what SQL Server thinks about your data. This will be a three part series where we’ll learn how each join algorithm works and what they can reveal about our upstream execution plan operators. Nested loops joins work like this: SQL Server takes the first value from our first table (our “outer” table – by default SQL Server decides for us which table of the two this will be), and compares it to every value in our second “inner” table to see if they match. Once every inner value has been checked, SQL Server moves to the next value in the outer table and the process repeats until every value from our outer table has been compared to every value in our inner table. For more in-depth explanations of the internals and optimizations of nested loops joins, I recommend reading this post by Craig Freedman as well as Hugo Kornelis’s reference on nested loops. What Do Nested Loops Joins Reveal? Knowing the internals of how a nested loops join works allows us to infer what the optimizer thinks about our data and the join’s upstream operators, helping us focus our performance tuning efforts. Nested loops joins are CPU intensive; at worst, every row needs to be compared to every other row and this can take some time. This means when you see a nested loops join, SQL Server probably thinks that one of the two inputs is relatively small. … and if one of the inputs is relatively small, great! If instead you see upstream operators that are moving large amounts of data, you may have a estimation problem going on in this area of the plan and may need to update stats/add indexes/refactor the query to have SQL Server provide better estimates (and maybe a more appropriate join). If a RID lookup exists, it’s usually easy enough to add a clustered index to that underlying table to squeeze out some extra performance. If either RID or key lookup exist, I always check what columns are being returned to see if a smaller index could be used instead (by including a column in a key/column of an existing index) or if the query can be refactored to not bring back those columns (eg. get rid of the SELECT *). Nested loops joins do not require data to be sorted on input. However, performance can improve with an indexed inner data source (see animation above), and SQL Server might choose a more efficient operator if the inputs are both sorted. At the very least, nested loops joins make me think to check whether the input data isn’t sorted because of some upstream transformations, or because of missing indexes. So while nested loops in your plans will always require more investigation, looking at them and the operators around them can provide some good insight into what SQL Server thinks about your data.